Grand View’s Winter Culinary and Wine Experience weekend, sponsored by MN Monthly Magazine, is back and better than ever this February 7-9, 2014! With over 100 vintages, culinary classes and wine seminars, a soup challenge, annual artwalk and special guest, Amy Thielen, the weekend is tastefully sensational. The weekend kicks off on Friday, February 7 with the Robert Sinskey Vineyards Wine Dinner. Cost is $95 per person and reservations are required as space is limited. Click here to view the decadent menu. Saturday afternoon, enjoy several culinary classes and wine seminars including sushi and sake, cheese varieties, oils and vinegars, along with several chef demos. Sample several of our chef’s prized soups and vote for your favorite during the soup challenge. Minnesota native and the host of Heartland Table on Food Network, Amy Thielen, will also be in attendance. A 2011 James Beard Award-winning food writer, she has written for Saveur, Men’s Journal and the Minneapolis Star Tribune, and recently published her book, The New Midwestern Table. She will be here to demonstrate one of her Midwestern classics and to sign books. Later Saturday afternoon, experience over 100 of the finest wines and variety of culinary flavors delicately prepared by our talented chefs during the de’Vine Grand Tasting. The de’Vine Artwalk will follow the de’Vine Grand Tasting from 4:00 p.m. – 5:00 p.m and give attendees a first-handed opportunity to vote their favorite canvas from the top 20 submitted. The final artwork chosen will be featured on the 2014 Grand View Wine bottles – including both the Chardonnay and Cabernet Sauvignon vintage. The evening entertainment will be provided by the talented, Divas Through the Decades which is a musical tribute to some of the most influential female vocalists in American pop music, featuring songs from the 40’s, through today’s current hits! Click here to see a sneak peak of the Divas. Sunday morning, start your day off with an exclusive Champagne Brunch Demo in Cru. Excluding Friday’s Wine Dinner, the de’Vine weekend is only $224 per person, which includes lodging and breakfast each morning. This also includes one of Grand View’s signature wines. For those who already have cabins in the area, the Saturday Event pass is only $95 per person. You can purchase the Saturday Day Pass at the Grand View Lodge Front Desk, or by calling 218-963-2234 to purchase advance tickets. Ooh, Ahh, Spa with these New Services! It’s time to revive your skin from the long, hot summer days and prepare for another beautiful fall in Northern Minnesota. What better way to re-energize your mind, body and spirit than taking some time for yourself at the world-renowned, Glacial Waters Spa. With several new services and our partnership with Minnesota Monthly magazine, we brought back the popular Ooh Ahh Spa package! You just can’t pass up this spa opportunity! We invite you to come stay and let us pamper you for $219 per person when you book on the Ooh Ahh Spa package. Offered from October 20-December 19, this package includes deluxe lodging with continental breakfast, a $200 spa gift card (per person), access to the sauna and steam shower at the spa as well as access to the pool and hot tubs located on property. For more information on this fantastic spa getaway click here. See below for several of our new services you deserve to try this fall! The Awakening – a full-body treatment combined with exfoliation, warm hydrotherapy, and a chilled stone massage for a relaxing and exhilarating experience. Neuromuscular Therapy (NMT) – uses specific detailed massage techniques to target the neurological system and the muscles related to it. This massage focuses on trigger points and muscle issues to help alleviate chronic pain and discomfort. Biodynamics Facial & Tahitian Body Wrap –where skin care meets full body relaxation. Allow us to guide your senses through a Tahitian Body Wrap, followed by a full Biodynamic Facial. These products are the purest, most nutrient-rich Mother Nature has to offer. Grand Champagne Facial & Body Wrap – a luxurious treatment that includes all of the extras. Organic skin care paired with products featuring grape extract to treat a multitude of skin issues. Our pineapple enzyme peel, eye and lip facial plus a softening champagne mimosa hand and foot treatment complete this elegant experience. NuFace Microcurrent Facial Lift – a non-invasive rejuvenating microcurrent treatment to tone and tighten the skin and muscles of the face and neck. Features the Hungarian plant stem-cell age corrective facial products. Complete with anti-aging massage techniques, this treatment is sure to give you a lift. Himalayan Detox Manicure – offers a full service manicure and includes nail shaping, conditioning of the cuticles and a hydration masque. While your hands are being pampered you will also enjoy our Himalayan salt rock. When Himalayan salt rocks are warmed the salt release negative ions that are anti-microbial, as well as air and skin purifying. Detox Pedicure –an 80-minute experience that utilizes purified sulfate crystals to help release the toxins of the 500,000 sweat glands found within your feet. This soak is sure to make your feet feel amazing. The extended service will also include nail shaping, conditioning of the cuticles, exfoliation of the feet, and a masque. This service is followed by a relaxing massage of the hands and feet. Glacial Waters also added several enhancements such as a Pedissage or Scalp Massage, the Firming Leg Treatment and the Hand & Foot Quench, just to name a few. For a complete list of services and pricing, please click here. This year, Grand View and Minnesota Monthly magazine are teaming up again to offer our fall Fork-n-Cork package good for October 21 – December 14, 2013. This very popular package includes two nights lodging, a delicious breakfast each morning, a bottle of Grand View’s Signature Wine, and a $200 Dining Card for our fabulous dining venues or wine tastings. For only $319 for two people for two nights and including a $200 Dining Card makes for a fantastic reason to come to the area to enjoy the changing of the seasons. The Dining Card can be used for wine experiences or dining at Cru Restaurant and Wine Bar, Lodge Dining Room and Northwoods Pub for food and beverages. For more information on this delicious package, click here. The MN Monthly All-You-Can-Spa in a Day! 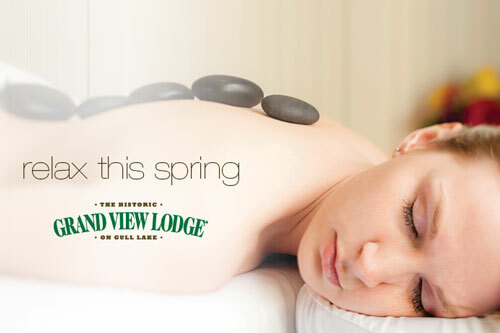 In cooperation with our friends at MN Monthly Magazine, Grand View Lodge will be celebrating the 10th Anniversary of Glacial Waters Spa with the most amazing package focused on indulgence, relaxation, and refreshing of your skin, face and body from the harsh elements of winter. This weekday only spa package is available April 14 through May 23 and offers unlimited 50-minute services from several categories – facials, manicures, pedicures, massages, body therapies and make-up application with their new make-up line, Jane Iredale. Whether you want to make a getaway out of it, or just come for the day, the All You Can Spa package is available for guests Monday through Thursday. For those that want to spa and stay, the package is available for $319 per person and includes 2 nights deluxe lodging with breakfast buffet daily AND your one-day of 50-minute unlimited spa services. If you can only getaway for the day, the package is available for $250 per person, which includes your 50-minute unlimited spa services. With spring right around the corner, Glacial Water Spa also is changing their hours! It will now be open Monday through Wednesday 9a.m.-7p.m., Thursday 10a.m.-7p.m., Friday and Saturday 8:30a.m.-8p.m., and Sunday 9a.m.-5p.m. Make sure you stop in and check out all their new specials, products and their recently released make-up line, Jane Iredale. For more information, or to book this celebratory spa package, please call (218) 963-2234 or 866-801-2951. Rejuvenate your skin and body from the harsh winter and get it ready for long, warm days of spring! As the saying goes, “April Showers bring May Flowers, “ and with any luck, the hope for warm weather, blue skies and the smell of flowers and trees blossoming will soon become a reality. And as the days grow longer, so do the amount of activities and events in central Minnesota. An exciting way to kick off spring is to grab the fishing pole, a bag of shiners and head to the lake for the annual fishing opener, set for May 11, 2013. 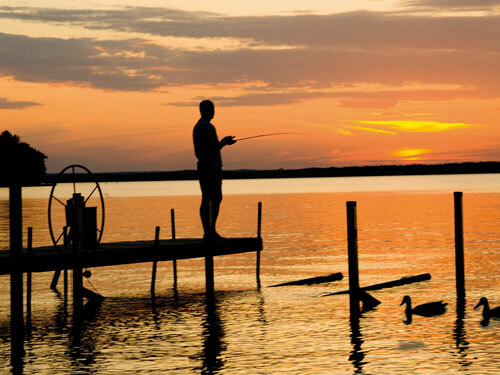 What makes the area perfect for fishing opener is that Gull Lake ranks as one of the top ten walleye lakes in the state of Minnesota. Not only that, but since 1959, the Nisswa Chamber’s Welcome Wannigan serves hot coffee and donuts to the fishermen on Gull Lake boat to boat. Traditionally, Miss Nisswa also is on board the pontoon—rain, shine or snow—¬to welcome the fishermen! Another exciting event is the May 11th Nisswa Shop, Drop and Stroll – a day where shopping and supporting a good cause are fused together! The day kicks off at 10a.m. and runs through 5p.m. where attendees can shop their favorite stores and stroll the streets where they will enjoy treats, discounts and giveaways. All that is required is to drop a non-perishable food item to the Nisswa Chamber office to show support for the Lakes Area Food Shelf (cash donations accepted as well). For more information, please visit the Nisswa Chamber. If you love food and wine, then this April 4 through May 9, Grand View Lodge is the place to be! In cooperation with Minnesota Monthly Magazine, our Fork-N-Cork package is back for spring! Join us for 2 nights lodging, a delicious breakfast each morning, a bottle of Grand View’s Signature Wine, and a $200 Dining Card for our fabulous dining venues or wine tasting classes. Packages start at only $299 per two people, for two nights. Additional nights start at $79 per two people. To book your spring wine and culinary experience, please call (866) 801-2951 today to reserve this limited time experience. No matter what your fancy is, there is always something going on this spring at Grand View or in the area. Check out the Grand Offers page and the Nisswa Chamber to find the perfect spring getaway for you!